AWWWWWWW! Merry Christmas to you too, my dear! Thank you! Clyde is going parading on Christmas morning with his decorations. He's so vain, he probably thinks this post is about him. He's so vain, he probably thinks this post is about him. We are going for a group ride in the empty streets of the city on Christmas morning. Decorations were highly encouraged. It should be fun! So there really is a wine with this label? I'm getting some! i'm pretty sure i've seen it at costco and at the targets that carry wine. Ooh! I just put mine on too - two strands. One on the upper, one on the lower. They can be steady on or flash - green, red, yellow. Can't wait for the ride in tomorrow - and the ride home tomorrow night! I'm really looking forward to it too! Hope my swag stays on. Festive!Clyde is awesome. Merry Christmas! I swear he shifted gears more smoothly this morning. He's like a guy in a tux. Smooth. Thank you. And to you and your family. Clyde seems to think so. He was Mr Smooth going in to work today. See the blazing Clyde before us! I know there is a wine like that because there was a massive display at the local liquor store and I asked them to let me have a poster when they changed the window. That is so cool! That you asked, I mean. And they agreed. And I'm getting some of that wine because apparently it's been banned in Alabama for its pornographic label. I don't care if it's pure swill. That alone makes it worth trying. Oh, Clyde all decked out for Christmas! Merry Christmas to you too! Thank you. It's very festive around here! Hope you have a lovely holiday. Thank you! 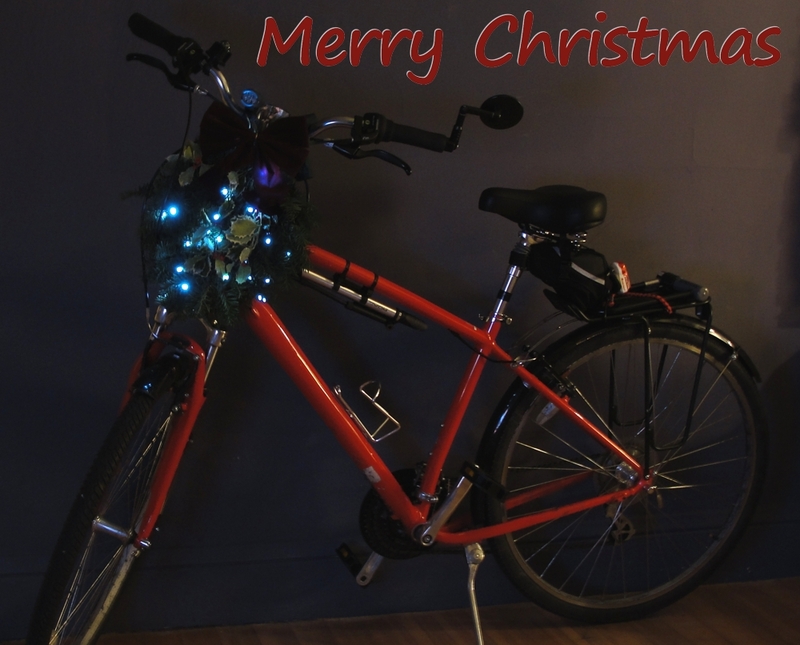 We had a lovely and festive ride in to work today, and we're going on a Christmas morning ride tomorrow in the hopefully-deserted streets of the city. Thanks for the good wishes and I hope you are enjoying your vacation.